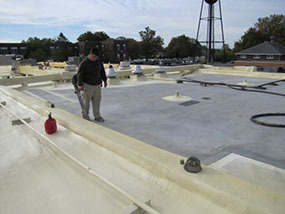 Are you wondering what Spray Foam Roofing is and if it is a better option for your building in Lancaster OH? Let’s help you make up your mind. What we do is that first, we inspect the roof. We install the SPF roof systematically, making sure that it has high-grade insulation and excellent protection. We make sure that it makes the roof more secure than it was before. Here is what you need to know about this kind of roofing and what we can do to make it better for you. The other name for spray foam roofing is SPF or Spray Polyurethane Foam (SPF), which is a kind of plastic. It comes in the liquid form but turns solid within a matter of seconds during the roof installation process. The volume of the roof increases approximately thirty times as it dries. Overall, this form of roof is the most economical, waterproof, sustainable, and cost-effective alternative today. Yes, we recommend it for your commercial buildings and private property because the weather here requires durable roofs. 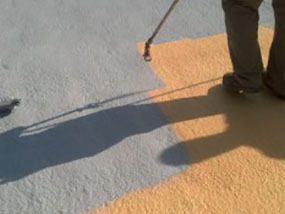 The SPF roof expands in the heat and this avoids cracking and damages. In the cold, it helps insulate the heat in the building, keeping it warm and comfortable. In the hot season, it reflects away the scorching sun and UV rays, keeping the inside of the building cool. There are some very good reasons to consider installing the Spray Foam Roof in Lancaster OH. Our experts at E & E Construction Company have years of experience in installing spray foam roofing. What makes us famous in Lancaster, OH is our dedication to serving the people with the best. We stick to work ethics on the job, offer affordable prices, and only use the best materials from leading industries. Therefore, you can rest assured that we will prioritize your satisfaction and will not compromise the quality of your roof. Pick up the phone, dial (740) 331-0695 and speak to us about it a SPF roof is right for you.